HostingFuze Network Review 2019: Is HostingFuze Network a Good Hosting? Based in Bucharest, Romania, HostingFuze Network is a Voxility DDoS protection reseller of shared hosting, VPS, dedicated servers, and colocation services for organizations of all sizes. Their hosting is designed with security and privacy in mind. Founded in 2009, HostingFuze Network is a Romanian web hosting company that provides reliable SSD shared hosting, VPS, and high-performance dedicated servers built on solid infrastructure. They’re also a reseller of Voxility DDoS protection solutions, which come packaged with all of their hosting plans. For anyone interested in cloud VPS hosting, you are spoiled for choice. You can choose to host your server in either Bucharest or Paris. 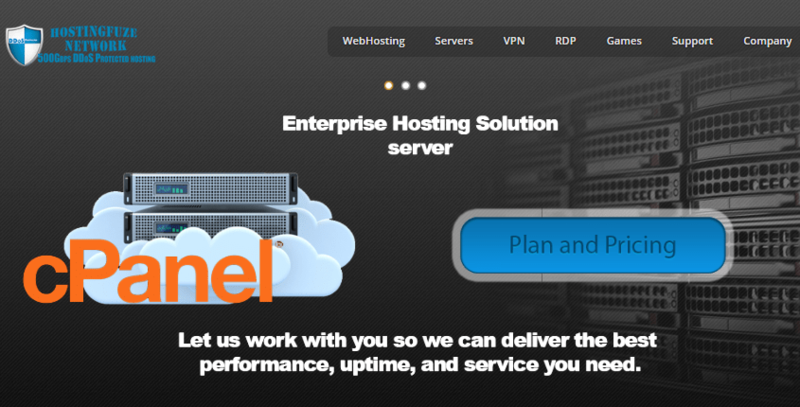 Built for speed, you can order and deploy your VPS within minutes. Several plans are included for each location with different CPU cores and memory available. However, all the packages come equipped with SSDs for better performance, along with free 1Tbps DDoS attack mitigation. Colocation services are also available at the Voxility Romania datacenter. You can rent from a single rack space, a cabinet, or book a space for as many servers as you need. Free cabling and equipment are provided. You also don’t need to pay for the handling of shipping equipment. Voxility dedicated servers are available to customers who need more resources or configuration options. You can choose self or fully-managed options. Each server comes with either SATA or SSD storage. Both Windows and Linux OS variants are available. Additional services offered by HostingFuze include VPN, TeamSpeak DDoS protection, custom game servers, and Seedbox. You can also register your domain with them. With no contracts and high-grade software, HostingFuze Network guarantees you good value for money. You can sign up, scale, or downgrade your plans without worries. Overall, I found their packages to be fairly priced with quick setup times. HostingFuze Network offers a trial of their shared hosting services, but these aren’t readily available packages: you’ll have to write in to enquire, and they’ll assess your suitability on a case-by-case basis. Other than that, they’ve got a 30-day money back guarantee on shared hosting packages, so you can take their server out for a test run and see if it fits your business needs well. What I like about HostingFuze Network is that they have dedicated server technicians who are available around the clock. You can contact them via email, support tickets, or their Romanian-based telephone number. No matter what issue you’re facing, you can count on them to offer you speedy solutions. If you’re looking for a feature-rich and secure hosting plan for a sensible price, then HostingFuze Network is the right place for you. With their status as a Voxility DDoS protection reseller, you’ll never have to worry about your website being attacked by malicious hackers. Wondering how HostingFuze Network stacks up against other Web Hosting companies? Enter any other Web Hosting company and we will give you a side-by-side comparison.